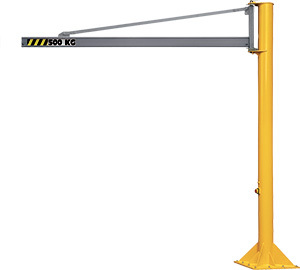 * Standard underbeam clearance = 2,5 m, adjustable higher or lower, accordingly modifiying overall height measurement ; for clearance higher than 4m, contact us. COMEGYSTEME hollow-section, aluminum pillar jib crane for indoor use, partial 270° rotation, with overbraced beam. Theoretical deflection under nominal load = approximately 1/250th of the span + height, without exceeding 1/100th of the span in itself. The Maximum Moment (MM) is given as rough guide and under nominal load. RAL 1028 yellow polyurethane finish for the pillar. Maximum hoisting speed = 16 m/min.